Fulton Food Hall is a Food Lover's Dream when that food lover is a little undecided. Are you not sure if you want pizza or sandwich or Mexican or Asian? If you like sushi or want noodles, they have it all. This food hall market-style restaurant does everything to appease as many customers as possible, but don't confuse it for a food court and don't confuse it for a buffet. There is real, good-quality food coming from the many kitchens here. When you try the ramen noodles you'll realize that each individual station also has individual chefs who work hard at their craft. Sushi is handmade nearby at a sushi bar, sandwiches are prepared off-site but brought to the counter & Pizza is baked right in front of you. Your morning cup of coffee can be purchased at the counter with fresh pastries or you can elect for table service with a much wider menu. No matter what you choose, it is still a very good deal. Located inside the hotel, this cheap food option is an upgrade from typical budget hotel offerings. Harrah's Las Vegas still has a buffet and fast food is still available right outside the entrance but this option is significantly better than both of those. If you're craving fried rice and you only want to spend $4 or a simple McDonald's hamburger will do the trick, then fast food might be what you want. 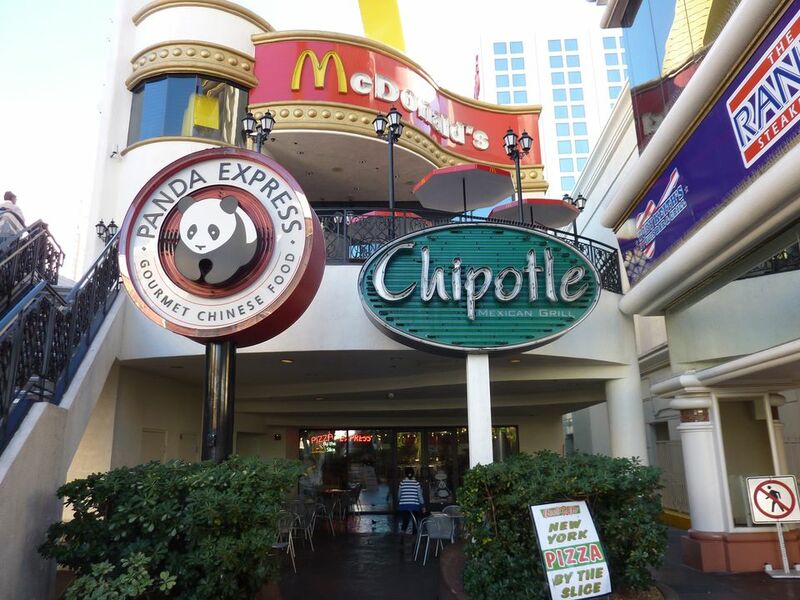 Located right on the strip, this is a good alternative to eating in a casino and the cost is what you would expect from these popular chain restaurants. Walk north along Las Vegas Boulevard past Wynn Las Vegas and Tacos El Gordo serves up good, cheap tacos for the best prices that you'll find on Las Vegas Boulevard. If you walk south along the strip you'll come to the LINQ entertainment district where you'll find pizza by the slice at Flour & Barley as well as Fish and Chips at Gordon Ramsay Fish And Chips.